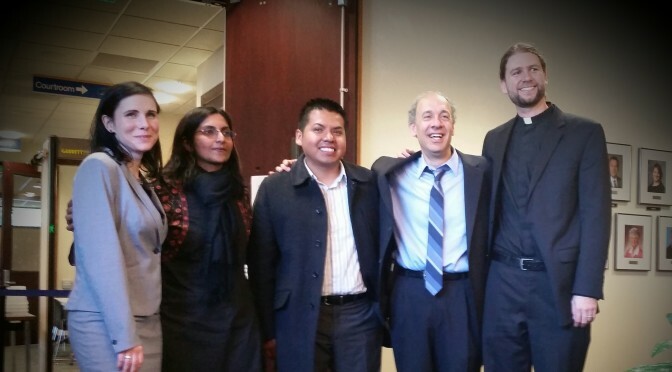 All charges against Councilmember Sawant, Reverend John Helmiere, and Alaska Airlines baggage handler Socrates Bravo were thrown out today as the judge heard the City of Seatac’s case and found it uncompelling. On April 15, over 60,000 union members, students and low wage workers in 230 cities across the country walked out of their work places and classrooms to march, rally and occupy for a $15/hour minimum wage and the right to a union. SEIU played a key role in providing organizing resources, organizers and mobilizing it’s membership to come out for the day of action. 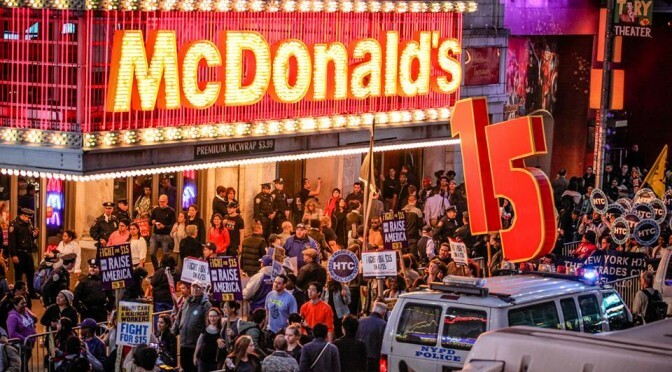 With its focus on building a broader campaign, 15 Now also played a critical role in mobilizing, organizing and supporting the strikes and direct actions. 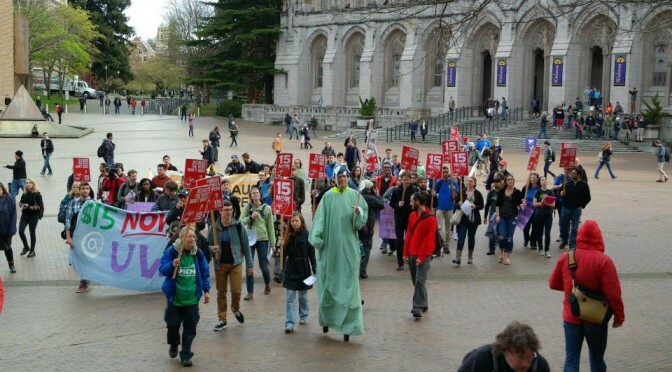 40,000 Seattle workers got a raise on April 1 (from $9.47/hr to $11/hr, $10/hr for employees at small businesses who receive tips and/or health benefits), but the University of Washington administration is claiming exemption from the city’s new minimum wage. 15 now, in coalition with unions and supporters, brought the good news to low-wage workers on Saturday, March 28: Seattle’s getting a raise! 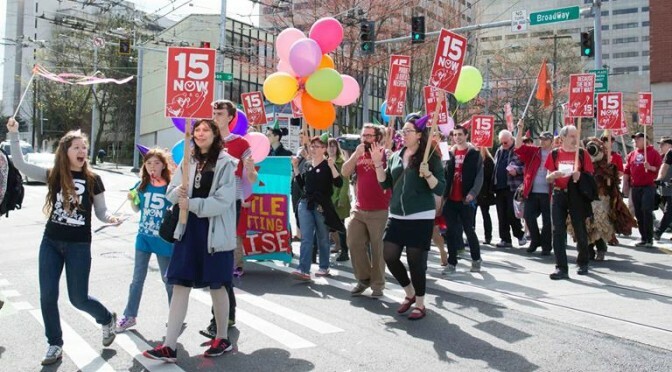 Last year Seattle made history by becoming the first major city to pass a $15 minimum wage for all workers, raising the wages for 100,000 workers. This historic victory kicked open the door for other major cities like San Francisco to follow, with communities rising up and demanding a $15 minimum wage in cities near and far from Portland to Minneapolis. Join 15 Now, labor unions, and Councilmember Sawant on March 28 to let workers know they are getting a raise! 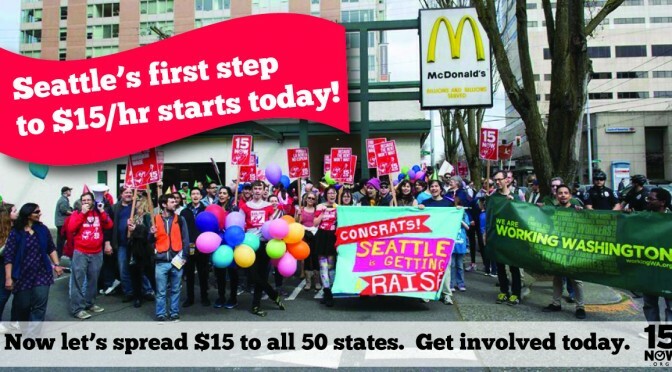 “The $15/hour minimum wage movement delivered a resounding one-two punch against right-wing opponents of 15,” began a triumphant Facebook post by Socialist Seattle City Coucilmember Kshama Sawant on Wednesday, March 18. 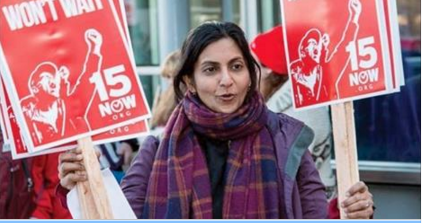 Sawant and 15 Now played an instrumental role in helping pass the historic minimum wage law in Seattle that goes into effect on April 1, giving a pay raise to more than 100,000 workers in the city, and eventually raising the minimum wage to $15/hour. 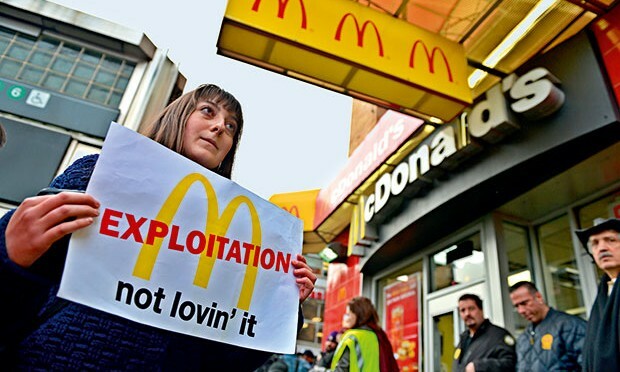 With just a few weeks until the law goes into effect, big business is still resisting.